A new semester of living in THIMBY begins. Reflecting back on the entire tiny house experience, it’s hard to believe a year ago our team was frantically orchestrating all-hands-on-deck weekend work parties, roping in all our friends and contacts in order to finish the house in time for the SMUD competition in October. And now, I’m sitting here at the desk in front of the south-facing windows, writing this blog post. We really have come a long way. And while the house systems are still far from perfect, we have another semester here at the Richmond Field Station to make progress before moving the house to a more permanent location and handing it off to another user in the spring. Due to weight issues, THIMBY did not make it up to Lopez Island for the summer. After getting her all cleaned up and ready to go, it turns out the house was too heavy for the 1-ton pick-up, Big Red, that we purchased to tow her up north. We found out after towing the house one exit on the highway, feeling like the house rather than the truck was in control, then taking it to a weigh station and discovering the house weighs 15,000 pounds rather than 11,000 as we thought. So, luckily nothing was hurt or damaged in the process, and we decided to cut our losses and just leave the house in Richmond for the summer. Now, back in the house, we have some new goals for the fall. Clean the water tanks, reinstall the lower planter box for greywater filtration, improve filtered greywater end uses, perfect the heating-composting toilet, get the inverter up and running (once and for all! ), gather data from the home energy management system, and finish our first academic paper on the THIMBY project-- an analysis of the building design-performance gap for the energy and water systems. We are meeting with students interested in building a second tiny house, with environmental engineers eager to optimize home greywater treatment systems, and with the Office of Local Government and Community Relations to discuss the City of Richmond’s interest in affordable tiny house communities. 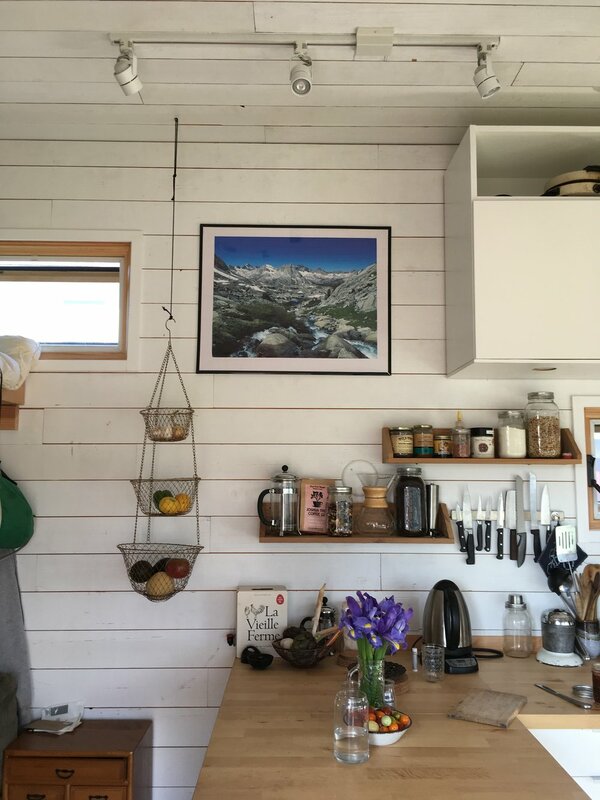 THIMBY still has a ways to go in realizing its full potential as an off-grid, climate-friendly, energy and water efficient, minimalist tiny house, but it is always making progress in that direction! Perhaps the most exciting thing about the house is how it functions dynamically as a living and research space; we are, in fact, both living and learning and gathering data in the house this fall again, and that is a truth worth celebrating. The vision of a community of happy grad students living in THIMBYs is still on the horizon. We spent the semester shuttling greywater samples to a Berkeley Environmental Engineering lab, driving cartons of urine to another lab perfecting urine-to-fertilizer resource recovery, and making waffles on the weekends. The cooking implements in THIMBY worked remarkably well the whole semester, and we hosted several successful dinner parties (of up to 10 people!). Grilling and porch space certainly helped with larger crowds. Given the information about our greywater (contaminated with bacteria and organic matter, but not E. Coli thankfully), we decided to pilot an additional system, a solar concentrating technology. Typically used for solar thermal water heating, we plan to repurpose the system for solar water disinfection. The idea is to run our filtered greywater through a heat exchanger with the 90C water, and inactivate bacteria that way. The solar concentrator is set up and logging data, and will be integrated with the water loop in the fall. Innovation never stops at the tiny house; I can imagine a day maybe a year from now where we sit back on the porch in lounge chairs (or in a hot tub hooked up to use the excess hot water from the solar concentrator), and say “Yes, everything is working perfectly as designed, and we just sit around here and use the systems and log the data through our smart Home Energy Management System (HEMS). Grad school research is the best.” We had a flurry of activity right when the semester ended and people had more time again. The HEMS infrastructure was re-established, using slightly more durable, and solder-able, perf board. An Arduino Uno connected to a Raspberry Pi provided the hardware to log the building performance data in real-time and to control heating and ventilation units remotely. We took apart the lower planter box to replace with a more traditional slow sand filter, and installed a settling tank under the planter boxes to remove turbidity and allow the UV light to function. And, we packed up the house to be “road ready” for the next THIMBY road trip adventure. If all goes according to plan, THIMBY will drive up to Lopez Island this summer, pulled by the trusty vehicle known as “Big Red,” a 3500 series ’93 Chevy Silverado. It was an ordeal shopping around for a functional used truck that would safely tow 10,000+ lbs, but we think we’ve got the truck for the job. The idea is to test out the systems in a truly “off-grid” setting (on a piece of farm property on Lopez), with long hours of daylight and more time to make adjustments and fixes. And, to see how mobile THIMBY really is! Stay tuned for the next post on the drive and ferry crossing to the island. Pretty darn good! A few weeks ago, THIMBY realized her second crucial stage of development: actually serving as a tiny home. One of THIMBY’s team members, Brett Webster, moved into THIMBY at the end of January, after weeks of hard work transitioning THIMBY from a demonstration home to a functioning structure capable of safely and comfortably storing a graduate student plus pared-down belongings. Well, really after a year of planning, designing, engineering, and building the tiny house from a trailer bed to a 210 sq. ft., off-grid tiny house with solar panels, a Tesla battery, and a home greywater filtration system. Over the past two months, the 24/7 frenzy of work parties, all-nighters, and super-human efforts needed to get the house ready for the SMUD competition has been replaced by steady progress towards getting the house ready for a resident. Meaning, coats of shellac for waterproofing the windows, waterproofing the bathroom plywood, insulating the toilet box and building the sealed lid, building extra shelving units, and integrating the carbon filter into the planter box filtration loop. THIMBY no longer exists as a competition stunt, but is now a true “living lab” for testing out residential water and energy technologies with an actual resident. Speaking of showers, because the greywater filtration system is currently plumbed so that greywater is filtered through a layered planter box, activated carbon filter, and UV light before re-collecting in a filtered tank, which is the cold water supply to the shower, you have to be really careful what you put down the sink or shower drains. Raw meat? Questionable. Blood? Probably ok, but worrisome at first. We’re testing out greywater filtration removal rates -- for turbidity, BOD, COD, E. Coli, nitrates, etc. -- in a Berkeley water quality lab, and will continue to gather data this spring on water quality and energy balance. The first few weeks in THIMBY have proved how collaborative and flexible you have to be to pioneer the off-grid variant of tiny living. Calling up team members and friends to help with critical repairs, and settling in slowly by unpacking some things and moving anything non-essential to storage, are necessary and unavoidable parts of the experience. But, in the midst of thinking critically about sustainable living, it's nice to realize you can still have 8 people over -- to discuss the next variant of water treatment systems, or just share beers and grill out on the porch with the sun setting over Richmond Bay. It was incredible to see the house we’ve been designing and building for 2 years actually sitting in a parking lot in Sacramento. Thanks to our extremely dedicated team, our awesome sponsors, and our friends and family, we were able to create a truly 100% solar-powered, off-grid tiny home. Today we’d like to recognize the support we’ve received from two of our great sponsors, Pella and Coldwell Banker. We worked with Pella to choose the perfect windows and sliding glass door for THIMBY. Thanks to the Pella team, we found what we had hoped for: small windows for the home’s south and east facades, and a sliding glass door that would make THIMBY feel more spacious. We are extremely grateful to these two organizations for their partnership. Over 800 visitors have already walked through THIMBY’s sliding glass doors, and we look forward to welcoming many more. THIMBY is well on its way through construction: design decisions have been finalized, walls have risen, and the most exciting part to many is yet to come — populating the inside of the house with appliances and furniture to make it functional and liveable. But what has to come before any of that? The electrical system! And trust us, it's much more exciting than just what makes the rest of the house run. Heating and cooking with electricity? How much flexibility is there in demand? What kind of weather/climate will the house be in? How much of a solar resource will the house have access to, or how much sun will it get? After we estimated the demand, we were ready to begin sizing components since we knew how much electricity we needed (roughly). But...what parts even go into a solar photovoltaic (PV) system? What's so exciting about our electrical system — other than the fact that it's capable of operating both on-grid and off-grid — is the specific components we integrated into our system. Through our partnership with Platt Electric Supply, we were given not only the electrical components for wiring the house's circuits, but also the StorEdge system for managing the flow of electricity among solar modules, grid, battery, and loads in the house. The newest technology from SolarEdge, this system combines the functionality of the combiner box, charge controller, and inverter in one smart system that keeps all components of the electrical system working optimally. Though they were designed for use in a house that has a connection to the electrical grid, we will demonstrate that they can work in an off-grid house on wheels. Moreover, Platt donated solar racking pieces from Iron Ridge to help us mount all of the modules and tilt them towards the sun through changing seasons. We've worked with our partners to modify the racking components from what they were designed for, allowing us to make use of nearly the whole area of the roof to generate electricity. So what's to come next? Finishing up wiring, installing insulation, racking and mounting the solar panels, and installing the battery — but one step at a time!